London mint plate coins from LMCC are now being offered for sale and those available are listed on the ‘Coins for sale’ page. Images are, of course, in the book but I will add images over the coming week. A selection of other London mint coins will also be added over the next month or so. Shipping is included in the prices and it is first come, first served. Email or message if you wish to purchase any of these. In this lecture organised by the Yorkshire Numismatic Society, Dr Andrew Woods, Senior Curator, York Museums Trust, discusses the Wold Newton hoard. The hoard was found in 2015 and acquired by York Museums Trust in 2016. It is now on display in the Yorkshire Museum. The hoard is one of the largest and best excavated coin hoards of the Tetrarchy ever discovered in Britain, and was buried at a time when York had a central role in the history of the Roman Empire. 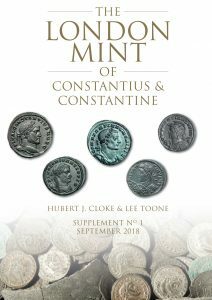 This talk explores its discovery, conservation, contents and what it can tell us about coinage in the early fourth century. Many thanks to Coin Collecting Magazine for recording the lecture. As we have previously reported, there have been some very interesting coins of the London mint found within the hoard. See previous posts below.